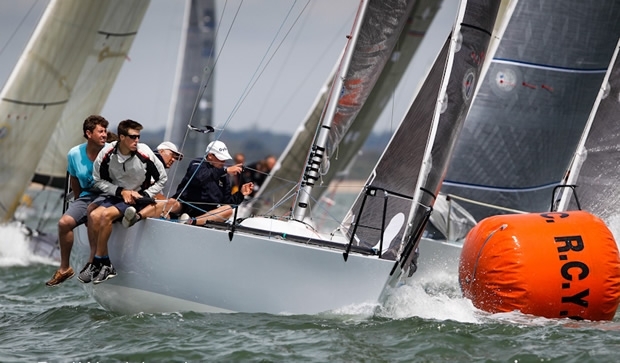 Fast, furious, nail-biting fun is the best way to sum up today's opening action at the 2012 Coutts Quarter Ton Cup in Cowes where the 30 teams enjoyed three amazing races in near perfect conditions. With only seconds separating many of the finishers, both on the water and on corrected time, the Quarter Tonners once again demonstrated why so many sailors have an enduring love affair with the class and what keeps them coming back time and time again. From the tiny Love in a Mist, Dragon supremo Eric William's 1974 Waarschip design - the smallest and lowest rated boat in the regatta, up to Diamund Foley's 1980 Bruce Farr-designed Anchor Challenge, which rates the highest, every team got a piece of the action at some point during the day. Overall it was Peter Morton's newly refitted Bullit that put in the most consistent performance winning races 1 and 2 and coming second in race 3 to lead the regatta overall - not bad for a team sailing their boat for the first time! While Bullit now has a relatively comfortable six point lead over their nearest competitor they most certainly didn't have it all their own way on the water and had to work extremely hard for their placing in each race. Also very consistent throughout the day was Rickard Melander's 1990 Phil Morrison designed Alice who kept nipping away at the heels of the higher rated boats to end the day with a 3, 4, 3 score line putting them second overall, six points behind Bullit. Aboard Rob Gray's Blackfun, the 1976 Laurie Davidson design he acquired earlier this year and has done considerable work on, the day got off to an average start with a tenth in race 1, but the crew then found their feet in race 2 and proceeded to go from strength to strength, adding a second and first to their card to claim third overall, three points behind Alice II and two points ahead of Sam Laidlaw's Aguila, a 1990 Vrolijk design, being helmed today by John Greenwood. Speaking after racing Alice II's pitman James Hynes paid humorous tribute to their nearest competitors saying: "Morty's definitely pretty quick upwind, but we reckon he's a bit weak downwind which is nice so we're going to play on that for the next two days! Sid [Howlett] and the boys on Blackfun, Rob Gray's boat, are definitely good all round. They got stuck up in the first race, but in the next two races they were good so I think they're going to be ones to play with as well. And then there are a few other people who are there or there abouts. We've just got to be consistent." Throughout the fleet there were constant battles and every mark rounding brought close quarters drama. Remarkably the Quarter Tonners sense of fair play ensured that there were no post racing protests - a situation no doubt aided by the unofficial class rule that protests will only be accepted if lodged with a fee of a case of champagne and that protests hearings will be held from 03.00 daily! Some of the closest action came in race 2 where Blackfun and Bullit came off the start line neck and neck and took off around the course trading tacks and gybes all the way. They were overlapped for much of the race and on the line Blackfun crossed just six seconds ahead but on corrected time victory went to Bullit by 27 seconds. While Blackfun had a relatively large 46 second winning margin in race 3 the fight for second was another humdinger in which Bullit eventually finished just one second ahead of Alice II with Tiger, helmed by reigning Coutts Quarter Ton Cup Corinthian Champion and Irish Independent/Afloat Magazine's Young Sailor of the Year George Kenefick, two further seconds back in fourth. Post-sailing Rob Gray confirmed that they are very happy with Blackfun's performance so fa,r but confirmed just how tight the competition is saying "She [Blackfun] certainly seems to going very well downwind and we're getting the hang of it a little bit upwind too. Morty of course has his new boat in straight out of the box going very, very fast upwind, slower downwind, and starting well, with a great team aboard. But if you look at the results, in some of the races there are seconds, literally ones and twos, between the boats. I think in the last race Morty beat Rickard by one second so it's all very tight and could go anywhere." The Irish have sent a strong contingent to this regatta with Tiger now lying sixth overall and several brand new teams racing in their first ever Quarter Ton Cup also putting in great performances. Diamund Foley's Anchor Challenge, which won the 2010 Coutts Quarter Ton Cup under Peter Morton's ownership and is sistership to reigning champion Espada, was the top performing new team today. Sadly Diamund isn't able to compete personally so Paul Gibbons is helming with former Irish Star Olympian Mark Mansfield calling the shots. A 6, 5, 6 score line puts them into fifth place overall just two points behind Aquila and 4 points ahead of Tiger. Also putting in impressive first timer performances were Ian Travers and Eamon Rohan's Per Eilsa and Jason and Dominic Losty's Illes Pitiuses who round out the top ten nicely in ninth and tenth respectively behind Coutts Quarter Ton Cup old timers Louise Morton aboard Espada in eighth and Darren Marston & Olly Ophaus's Cote in seventh. Three further races are planned for tomorrow with racing concluding on Wednesday 27 June. Up to nine races are scheduled with a discard coming into play once seven races have been completed.